I mentioned earlier that while I was on Flagyl I was unable to consume any alcohol, not even vanilla extract. But as I felt better, I was desperate to bake something. Have you ever tried baking without vanilla (I did not have any alternatives, like beans or paste, available)? It is really hard! I finally settled on blueberry crumbles, using some orange and lemon zest to boost the missing vanilla flavor. My first crumble was a complete failure. It had absurd quantities of butter (really a veteren baker such as myself should have noticed the ratio was off) and led to a big oven mess and a rather greasy cake. But I hit pay dirt with my next try. 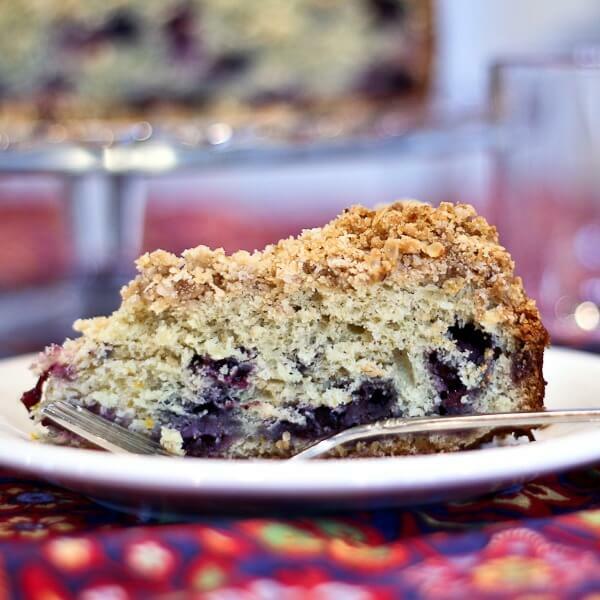 The recipe was actually for a blueberry breakfast cake, that I then choose to put a crumble (crisp) topping on. 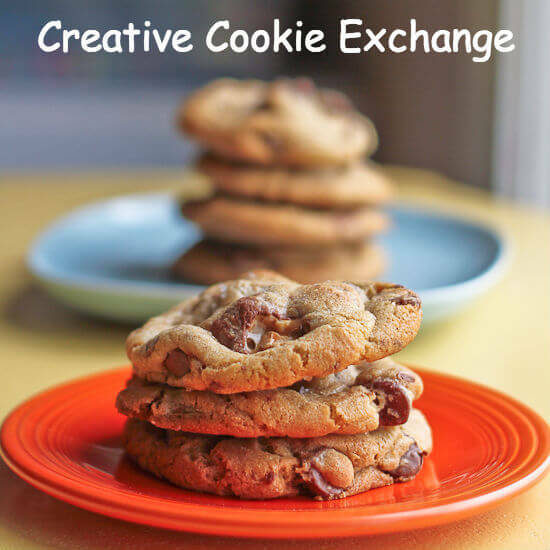 I found the recipe I adapted from in Lisa Yockelson’s Baking Style: Art, Craft, Recipes . I pretty much think anything Yockelson does is genius, so I was pretty sure that my plan of turning it into a crumble would work. It is buttery, tangy with juicy blueberries (please use seasonally frozen if it is not blueberry season where you are! ), and rich with the crispy topping. I used an oat crisp topping, but nuts would work as well. Just use whatever your favorite recipe is–I did not include a recipe because I was not diligent about measuring when I made it! A quick note about the blueberries: if you are using fresh (I did not), Yockelson recommends freezing them for an hour first so that when you fold them into the batter they are less likely to burst. Sammy and Alex made (under my supervision) the first buckle failure. As mentioned, it was the recipe’s fault, not user error. I made this buckle while they were out with their dad on a day when I was finally feeling a lot better. Amusingly, when they got home, they were both outraged that I had had the nerve to bake any kind of blueberry cake without them! Apparently blueberry cakes, much like muffins and brownies, have now been categorized as something that they believe they should be in charge of! Butter a 9 inch springform pan thoroughly. Set aside. Whisk together the flour, baking powder, baking soda, cream of tartar, salt and nutmeg. Set aside. Beat the butter on moderate speed until creamy. Add the orange and lemon zest and beat an additional 30 seconds. Scrape the sides and bottom of the bowl. Add the sugar, gradually, while beating the butter on moderate speed. When all of the sugar is added, beat an additional minute, until light and fluffy. Scrape the sides and bottom of the bowl again. Add the eggs, one at a time, scraping the bowl as needed. Beat for 30 seconds after adding each egg, incorporating the eggs into the batter. Beat in the vanilla if using. Remove 1 tablespoon of the flour mixture to a medium sized bowl. Set aside. On the lowest speed, add the flour mixture and sour cream, alternating, in 4 and 3 additions, respectively. Begin and end with the flour mixture. Toss the frozen blueberries with the tablespoon of flour. Then gently fold the blueberries into the cake batter by hand. Scrape the batter into the prepared springform pan. 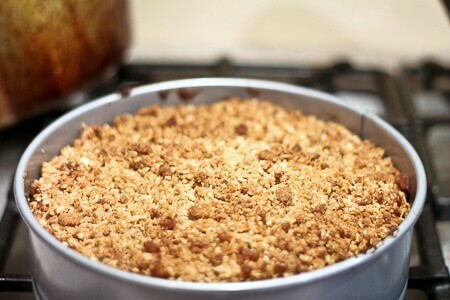 Sprinkle the unbaked crisp topping over the cake evenly. 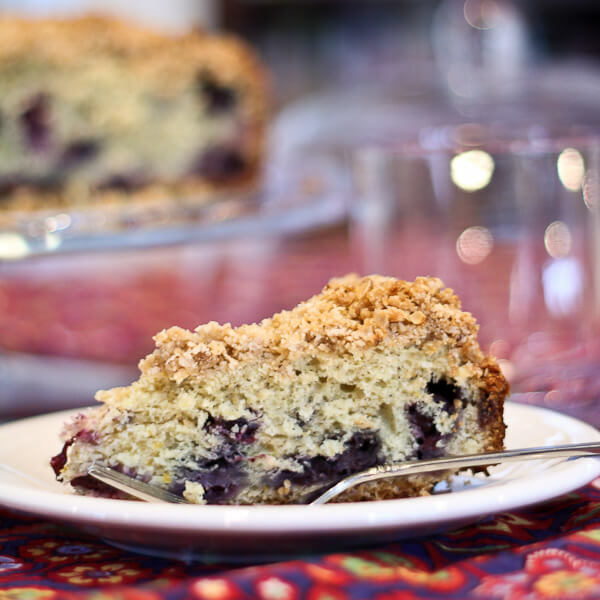 Bake for 50-60 minutes, until the topping is brown and crisped, and a cake tester inserted into the center of the cake comes out with only a few crumbs or blueberry juice on it. Let the cake cool in the pan for 10 minutes. Then remove the outer wall of the springform pan and let cool completely. You know, I never would have thought about how paralyzing not being able to use vanilla is! Until now. I’m glad this cake was a winner even without it! Ina Garten has a similar recipe that I adore if you want to try it some time. Sounds good! I wish I had this for breakfast right now! Oh my gosh…I love this buckle! Any cake with streusel, crisp, crumble etc..makes me weak in the knees, as you probably noticed in my quadruple streusel cake lol The combo of blueberry with lemon and orange is lovely and making my mouth water. Beautiful and delectable creation, Laura! I use vanilla so much too, but I always have beans on hand. Upping spices could help replace the flavor. 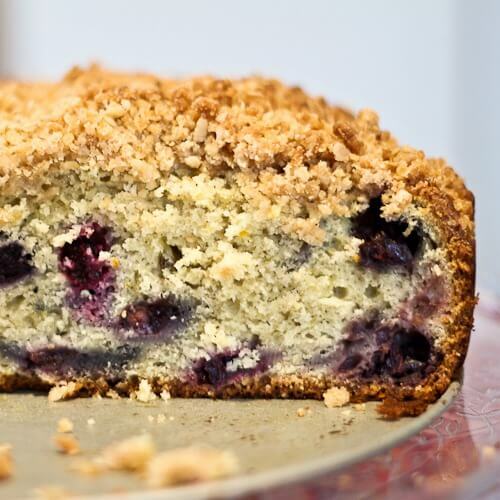 Blueberry buckle is one of my favorites. Martha Stewart has an awesome recipe which I adapted on my blog. It has tons of blueberries which I love. It’s one of my favorite things I’ve ever made. but there’s vanilla extract in EVERYTHING! at least, it’s in nearly everything i bake. the crumble you stumbled upon looks really good, and i do love a buckle!